The development has built a dedicated project room which is open 5 days a week and is available for local residents to drop in and learn more about the project and what it will be like upon completion. This includes statistics about the construction process as well as the positive benefits to the local community. This is a client run facility, but to promote collaboration and an open use of resources the facility is open to Sir Robert McAlpine as the main contractor to host events and drop in sessions. 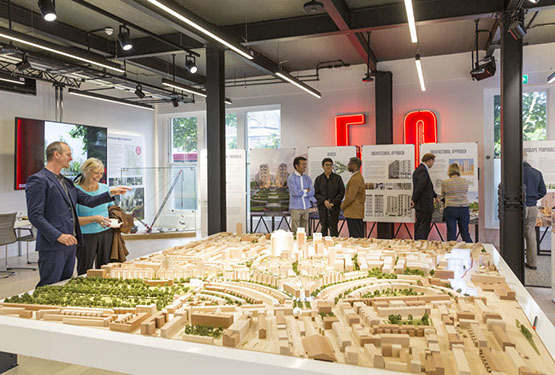 The space includes a large, scaled architectural model of the proposed development, a 3D virtual reality game where users can walk through the development and understand what it will look and feel like upon completion, interactive screens showing local amenities, an immersive cinema showing the development of Earls Court and London through the years and a model of London linked to a video showing the progression of development on a large scale across the city. Several community events have been held in the space including quarterly drop in sessions which allow residents to talk with the team. Also events are held one Saturday each month and have included painting sessions, visits from local schools, origami classes, and gardening. However the facility has also been used to carry out training and give presentations such as those for Green Building Week.